I thought this old place needed a new look but I had no idea how to implement it technically. Thankfully Bryn with the help of her father had the know how. I sent off the basic design to them and they did the techno magic to get it working. Hooray! I know I need to clean up the sidebars and work on organizing my flickr photos but what do you think of the new look? NICE NEW LOOK. AND DAMASK...MY FAV. Oh the new look is lovely! I definitely like the gray, and the damask on the header looks great. I DO miss the vertical pictures you had on the previous header. That said, I think this new look is very classy. It's exciting seeing it in action! Thanks for letting us work on your awesome blog!! Nice job..looks great..but either way it was nice to me. I think it needs some darker framing...like black sidebars or something. I like it! Funny, I just made my blog darker grey too. LOVE the new look. and i think it's very 'you' with the damask. love the new look, it is so you. I don't know if it is just on my computer but the blog list frame is breaking up...love the new look girl! To be honest, I find the grey a little dreary, but I like the damask and the graphics a lot. Love it. I love working with Bryn. I know I've been driving the poor girl crazy as she helps me with my work website, but she has been totally sweet about it. Now I want a make-over! lovin it!! but then anything u did would be gorgeous. seriously. I commented on your most recent post about how I love the redesign. But I do have to say (here) that the white on grey is SO much easier to read than the white on black. LOVE THE LOOK.  Been away for a bit in programmingland and I'm back to a yummy new Brooklyn Limestone treat!